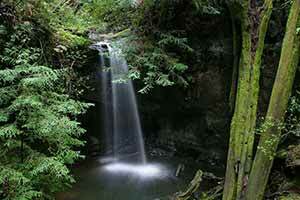 The Westridge Trail is one of the most challenging and scenic trails in Big Basin. 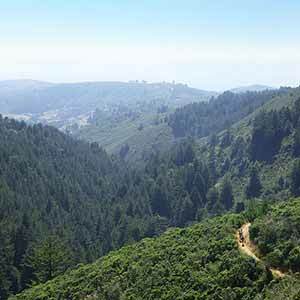 This epic day hike begins in the pretty Rancho del Oso valley, climbing 1,000 feet to a ridgetop with some nice scenic vistas along the way. 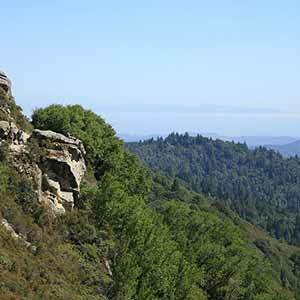 The trail then follows a remote redwood-covered ridge before breaking out into open chaparral and climbing Chalk Mountain, offering sweeping views over Big Basin and the coast. 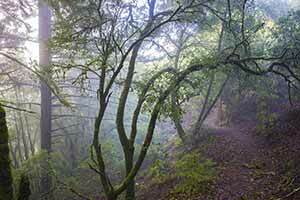 Finally, the route descends by the steep and attractively wooded Whitehouse Ridge Trail. 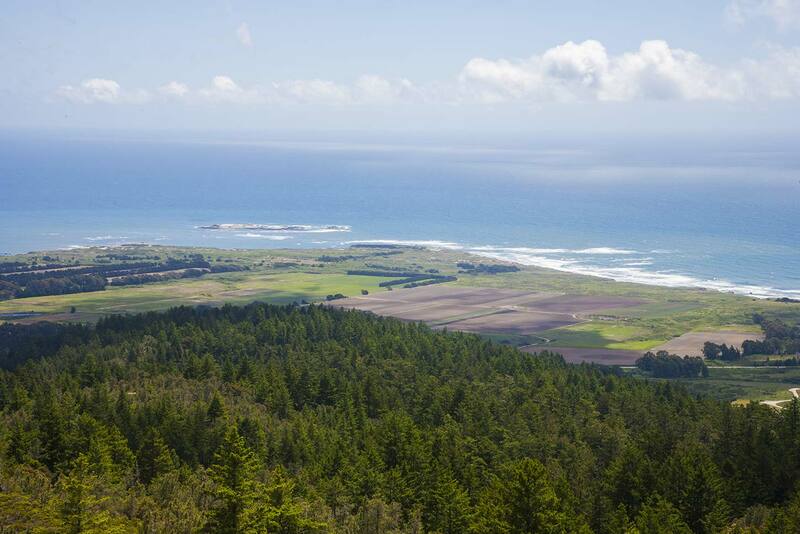 A complete round-trip hike on this trail, returning on Highway One, would be 19 miles. 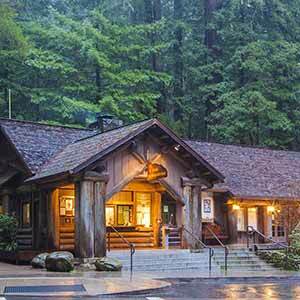 A better option is to return by car shuttle or bicycle along Highway One, making a 9 mile hike if you park at the Whitehouse Ridge trailhead or 12 miles if you park on the highway. Highway One does have a wide shoulder but speeding trucks and RVs make cycling on it somewhat hazardous. Hiking the trail from south to north provides increasingly dramatic views as the trail climbs up Chalk Mountain. If returning by bicycle, you’ll get a lot of help from the strong afternoon sea breezes that blow from north to south. 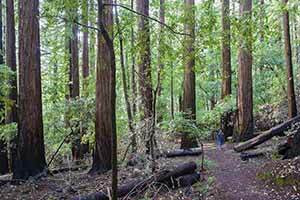 The hike begins in the Rancho del Oso section of Big Basin. 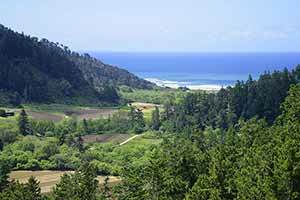 Here, the Waddell Creek valley widens into a scenic coastal plain dotted with vegetable farms and sheltered on three sides by green mountains. In the winter, it’s best to take the singletrack Skyline-to-the-Sea Bypass. This very scenic trail begins just north of the ranger station and climbs up to some excellent views before dropping back down to the valley. 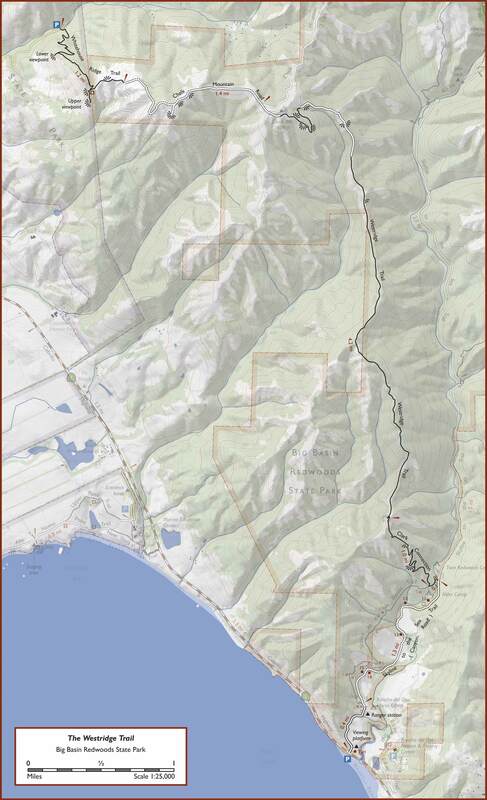 This route avoids a ford of Waddell Creek. In the summer it’s possible to take the dirt road, which isn’t as scenic but will save a little climbing. There’s a seasonal footbridge across Waddell Creek. 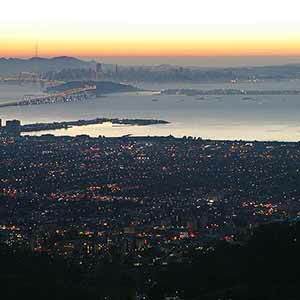 The Clark Connection climbs steeply up to the ridge, offering superb views of the Rancho del Oso valley. 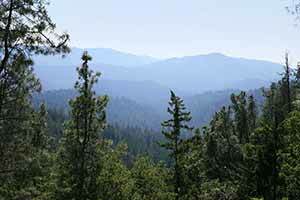 As it climbs, the trail becomes gravelly and the forest gives way to sunny chaparral. At the ridge, the trail meets the Westridge Trail. 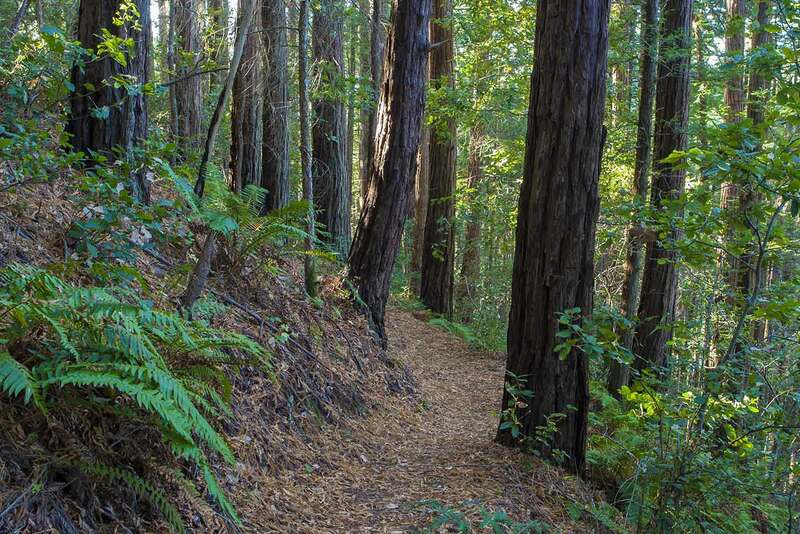 Signs indicate that this is a horse trail, which in Big Basin seems to mean “steep and gravelly” Turn right; the trail is initially narrow and heads downhill but soon widens and turns steeply uphill, entering a wooded area. 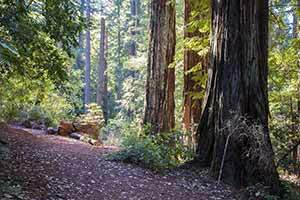 The trail undulates up-and-down for a bit before gently descending through second-growth redwoods, providing a nice rest. The long section of wooded trail provides some welcome relief from the sun, and it has a sense of remoteness that I really like. 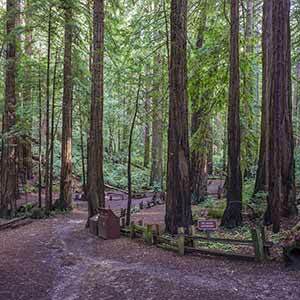 There are even a few brief patches of what appear to be small old-growth redwoods. 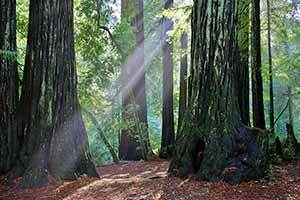 When the redwoods end, so does the easy hiking. 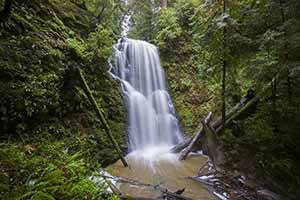 The trail plummets steeply and then climbs a series of knolls, finally ascending Chalk Mountain, offering stunning vistas over the redwood-carpeted Waddell Creek valley. This is the highlight of the hike; as the trail climbs Chalk Mountain you feel like you’re on the roof of Big Basin, with the green conifer-blanketed hills spread out below you. 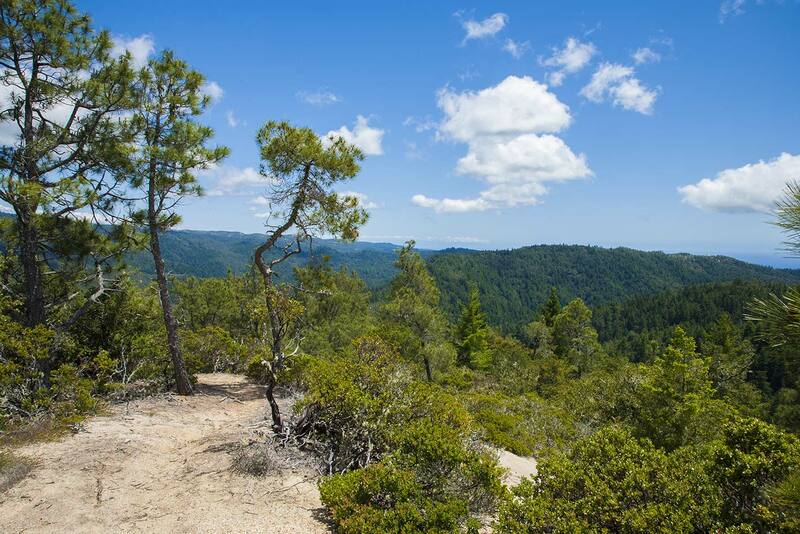 These are some of the best views in all of Big Basin, rivaled only by the coastal views to come. Chalk Mountain itself is a little anticlimatic, since the peak is broad and views are limited. 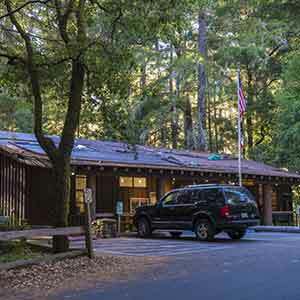 There’s an incongruous outhouse perched near the top, at the edge of the dropoff — undoubtedly the toilet with the most scenic view in Big Basin. A wide dirt road leads west toward the Whitehouse Ridge Trail. Along the way, a spur road leads to a knoll with a radio antenna and the most sweeping views of the hike, looking over the farmland on Año Nuevo Point. 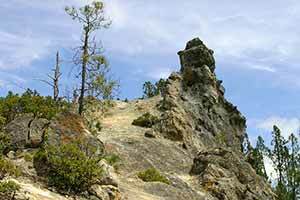 The Whitehouse Ridge Trail starts in chaparral with pretty views of the coastal hills to the north, then descends steeply through attractive woodland. Two short spur trails lead to the viewpoints. The upper viewpoint has an especially nice view of the coastal Ano Nuevo plain, with the Pigeon Point lighthouse visible no the north. 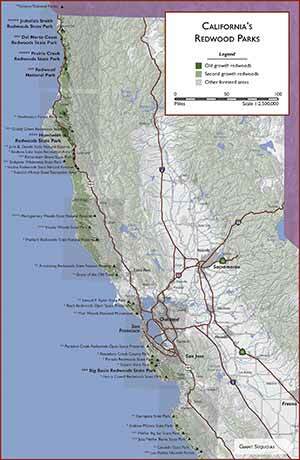 Both spur trails, however, are infested with poison oak. 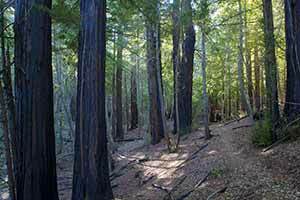 Between the upper and lower viewpoints, the trail passes through what looks like an unlogged redwood grove. 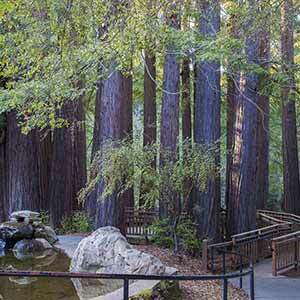 The redwood trees are so tiny that they can’t really be called “old growth” , but there aren’t any stumps, the trees aren’t all the same size, and the grove is relatively open, all of which suggests that the grove has never been logged. 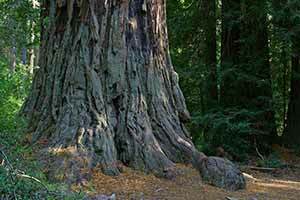 Some of the redwoods even have tiny goosepens, something usually found on much larger old-growth trees. At one point there’s a lush groundcover of redwood sorrel and ferns that give the grove an especially attractive appearance. 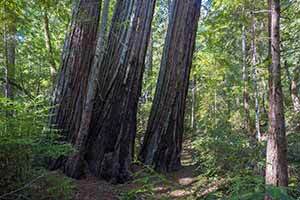 As the trail descends, the redwoods get bigger, but then stumps appear and the forest takes on the dark, disheveled, worn-out look of a second-growth forest. 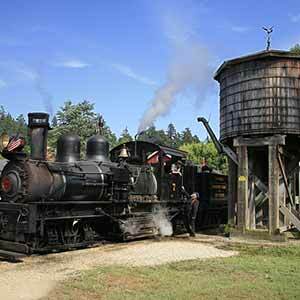 It’s possible that the upper part of the hill was never logged because the redwoods were just too small to make it worthwhile. Whitehouse Creek Road descends an additional two and a half miles to the sea, at first through redwoods by a burbling creek, then over a bare coastal plain backed by redwood-covered hills. It’s not a bad walk, although the road gets dusty in the summer and cars often pass by.